Looking for something to do in Savannah, GA this weekend? Come to Indigo Sky Community Gallery for a Gallery Talk! 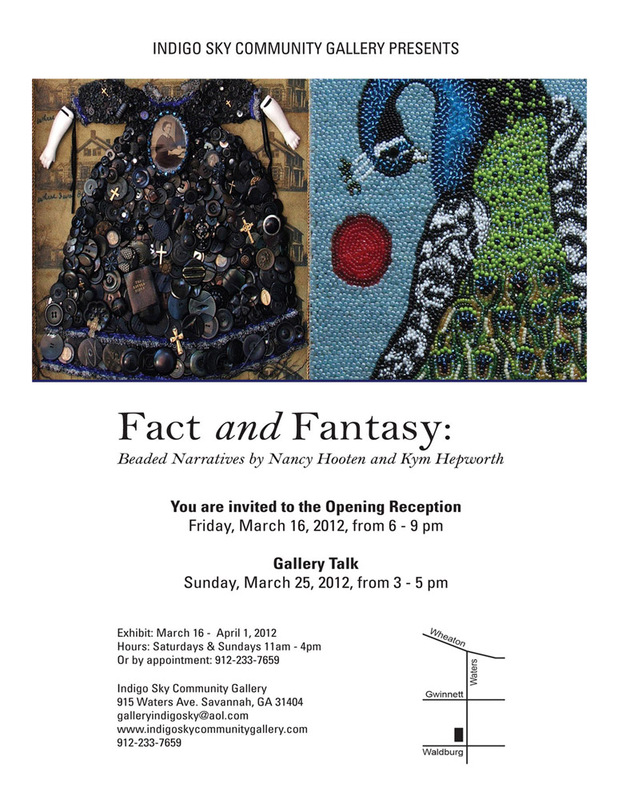 The current exhibit is a two-person show, Fact and Fantasy: Beaded Narratives by Nancy Hooten and Kym Hepworth. Tania Sammons, Curator of the Owens-Thomas House and Decorative Arts at the Telfair Museum, has served as curator for this exhibition and will talk about the show on Sunday, March 25th from 3-5 pm. If you'd like to read more about the exhibit, here's a link to the article, Beads of light & darkness, by Jim Morekis at Connect Savannah.